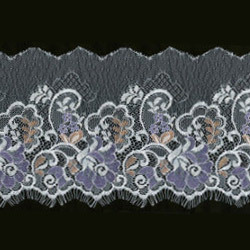 Raschel lace for using in home textiles such as tablecloth, bedspread, sheet, pillowcase. Or using in clothing accessories such as dresses, clothes, etc. 1. Accessories application: clothes, tablecloth, bedsheet, purse, etc. 2. Material: nylon. 3. Material change or not: yes. 4. Width: 150mm. 5. Color: triple color. 6. Color change or not: yes. 7. Elastic or not: no.